Nigeria's president has said for the first time he thinks sympathisers of the Islamist Boko Haram group are in his government and security agencies. Goodluck Jonathan's comments come amid a wave of violence blamed on Boko Haram which has left dozens of people dead in the north, most of them Christians. Mr Jonathan also said the security situation was now more complex than during the civil war four decades ago. More than one million people died in the 1967-1970 Biafran conflict. More than 80 people have been killed in recent weeks in attacks apparently carried out by Boko Haram, adding to the more than 500 killed in the past year. A 24-hour wave of violence apparently targeting Christian communities at the end of last week led to thousands of people, mostly southerners, fleeing parts of north-eastern Nigeria. There are also reports of northerners leaving their homes in southern areas, fearing reprisal attacks. Boko Haram, whose name means "Western education is forbidden", is fighting to overthrow the government and create an Islamic state. One of its factions has warned southerners, who are mostly Christian and animist, to leave the mainly Muslim north of Nigeria. A senior Christian cleric has warned that the country is sliding towards civil war. Mr Jonathan, a Christian, was attending a Remembrance Day church service in the capital, Abuja, when he spoke about Nigeria's worsening security situation. Of the Boko Haram sympathisers, he said "some of them are in the executive arm of government, some of them are in the parliamentary/legislative arm of government, while some of them are even in the judiciary". "Some are also in the armed forces, the police and other security agencies." The situation was, he said, "even worse than the civil war that we fought". "During the civil war, we knew and we could even predict where the enemy was coming from... But the challenge we have today is more complicated," Mr Jonathan said. "Somebody said that the situation is [so] bad that even if one's son is a member, one will not even know. That means that if the person will plant a bomb behind your house, you won't know." Boko Haram has staged numerous attacks in northern and central areas in recent months - on Christmas Day it attacked a church near Abuja, killing dozens of people. Last week the president declared a state of emergency in Yobe and Borno states, as well as Plateau state in central Nigeria and Niger state in the west, following a surge in ethnic and sectarian violence. 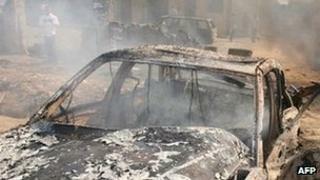 Adamawa state, where attacks on Friday left about 30 dead, was placed under curfew and security forces were deployed. Christian groups have accused the government of not doing enough to protect them. Pastor Ayo Oritsejafor, president of the Christian Association of Nigeria, said on Saturday that his members would protect themselves against the attacks. "We have the legitimate right to defend ourselves. We're also saying today that we will do whatever it takes" he said. The pattern of the killings suggested "systematic ethnic and religious cleansing", he added. Meanwhile, the government also faces the bleak prospect of a general strike on Monday amid popular fury over its removal of a fuel subsidy which has seen fuel prices double for ordinary Nigerians. Foreign backers for Boko Haram ?